Welcome to The Abso!ute Sound online! We explore music and the reproduction of music in the home. We believe that the sound of music, unamplified, occurring in a real space is a philosophic absolute against which we may judge the performance of devices designed to reproduce music. Our goal is to provide the resources consumers need to judge how a component's sound either honors or departs from the music's truth, and to make sound purchasing decisions that maximize their experience of reproduced sound. Below is our Issue 224, July / August 2012 table of contents and link to the editorial. 16 Industry News: Neil Gader reports from the Axpona Jacksonville Show, and Alan Taffel has the scoop on T.H.E. Show New York. 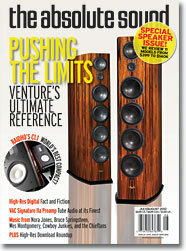 Neil Gader discovers a perfect use for Paradigm’s aptly named Shift desktop speaker. One of high-end audio’s premier speaker-builders brings its technology to a $399 desktop speaker — with startling results. Steven Stone has the story. 38 Absolute Analog: Rega RP3 Turntable: Wayne Garcia listens to an entirely new, affordable ’table from England’s venerable Rega. 42 What Exactly Are CD-Quality and High-Resolution Audio? Robert Harley explains what is — and what isn’t — high-resolution digital audio. Nationally syndicated talk-show host and best-selling author Dennis Prager explains why a high-end audio system is worth the price of admission. This new NAD incorporates the groundbreaking technology of the M2 in a unit at half the price — and adds more features, to boot. Robert Harley has the scoop. Neil Gader evaluates the new Clarus high-end cable line from industry pioneer Tributaries. Germany’s AVM might be a new name to North American audiophiles, but this 30-year-old company won’t stay a secret much longer, says Wayne Garcia. Garrett Hongo is wowed by VAC's flagship preamplifier. Will Venture’s Ultimate Reference live up to its lofty name — and equally lofty price tag? Robert Harley reports. This new compact two-way may be the most realistic-sounding loudspeaker Jonathan Valin’s heard. PLUS! An interview with Raidho’s Michael Borreson. 64 Compacts for Connoisseurs: Penaudio Cenya, Audio Physic Step 25, and Living Sounds Audio LSA 1 Statement Monitors. Neil Gader surveys three speakers that are small in stature but big in sound. This conventional-looking modest floorstander is anything but conventional in sound quality, says Chris Martens. The Danish manufacturer continues perfecting the art of the mid-priced floorstanding speaker. Kirk Midtskog has the details. Jacob Heilbrunn on a hybrid loudspeaker that combines dynamic drivers, ribbons, and a Heil Air-Motion Transformer in a magical mix. 90 Nola Metro Grand Reference Loudspeaker : Jim Hannon lives with this ambitious system from Nola. Andy Quint on a new, highly sophisticated program for dedicated collectors who want all the metadata and archival interconnectivity digitally encoded recordings allow. 138 Download Round-Up: Alan Taffel and Andrew Quint on recent high-res downloads: rock, pop, and classical. 140 Rock: New releases from the Cowboy Junkies, Dr. John, Norah Jones, Eric Bibb, Bruce Springsteen, the Chieftains, and the Steep Canyon Rangers, along with a smooth vinyl MoFi of Patricia Ahn. 146 Classical: Delibes on Reference, Jonny Greenwood on Nonesuch, Bach on Telarc, Canfield on Enharmonic, and Tchaikovsky on 2L hi-res download and vinyl. 148 Jazz: The latest from Joel Harrison, Gary Husband, and Ran Blake; Getz/Gilberto on SACD; and recovered treasures from Wes Montgomery on CD and LP. 153 Back Page : Mark O'Brien of Rogue Audio talks with Neil Gader.